Where do I find the best Chicken Rice? In Cumi & Ciki’s endless quest for good Chicken rice, we followed the trail to a place in Petaling Jaya. 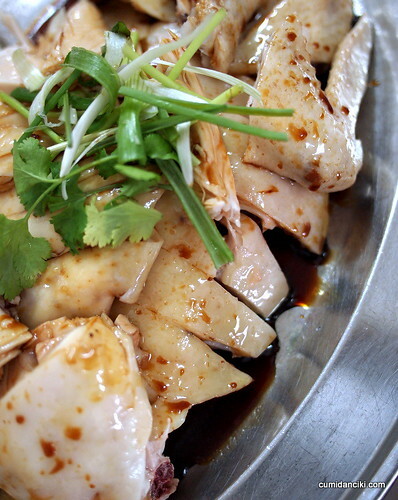 Pak Cham Kai is of course the Chinese way of saying Hainanese chicken or non-roasted chicken. When a lil fat monkey told me about this find, at first I was a little dubious. Hesitant. How many people claim they know the BEST chicken rice in town? Almost as many who claim they know the best Hokkien noodles.. Every time I venture somewhere to try someone’s best chicken rice, the chicken turns out dry or bony, or not flavoursome or just down-right inedible and full of fat. Anyway heading down to put the Monkey’s claim to the test.. we wondered to ourselves.. good or bad? .. please let it be good. Ah, did you know that to gauge how good the cook is, one should order the smooth, white chicken(in Malaysia, if you see a really fair chick walking on the road, we call her “Pak Cham Kai” .. you see what I am saying..? ) Pak Cham Kai a.k.a. boiled chicken, as opposed to its brown counterpart, the roasted chicken. The boiled chicken says more about the quality of the meat and hides less because it cannot conceal anything behind its non-roasted skin. In the roast chicken, the flavour can often be in the skin and not the meat. I loved boiled chicken that is prepared in the traditional Hainanese method which involves the boiling of the entire chicken in meat and chicken bone stock, reusing the broth over and over and only topping it up with water when needed, in accordance with the Chinese way of creating master stocks! In coffee shops you can see them bathing the chicken in this white, murky bath and imagine the flavours going into it. Wow.. are you excited now? The white, smooth skin.. the taut, sweet flesh .. the succulence of the meat, even of the harder parts like the breast meat, says that this is indeed an excellent version of the Pak Cham Kai for us, for now! This place seriously tops “Ipoh Comes to PJ” in terms of the chicken. The chicken rice was not bad but not the best we have had- very light and less oily than other shops. Some might argue not flavoursome enough nor lardy enough but we liked it. For health reasons of course. A lil Fat Monkey was right. Great Chicken rice Shop. And if you are wondering what the name of this shop is.. it is called Tasty Chicken Rice in Kota Damansara. Enjoy.. and Happy Malaysia Day! Next articleTop 5 cheap eats in Lower Manhattan – how to dine like a real New Yorker! Yeah, usually one must have the pak cham kai to truly enjoy the essence of the chicken, and the mastery of the cook. yes babe.. so u keep telling me.. so, where is that cooking bone in your skinny body eh? I don’t see it 😛 mwuahahahaha.. ! how i would like to have a plate of this at the moment..cant find a chicken rice stall that sells poached chicken here! really? ooo! i just had a brilliant idea.. if you never find a job as an accountant in Oz, open ur own chicken rice shop! yay! I am a very big fan of chicken rice and it’s very difficult to single-handedly point out what is considered the best. Some prefer the sinfully yellow chicken while some prefer the not too tender type. A slight variation of how it’s prepared could be telling to the discerning chicken rice lover down the the chilli sauce that comes with it. i beg to differ. one can ALWAYS tell a great, tasting chicken from an antibiotic-ed, supermarket substitute. With a name like “Tasty Chicken Rice” how could this restaurant disappoint?! U must try this chicken rice shop in Sban. it is in town, very close to the main Police station in town. Be prepared to wait about 30-40 mins for your food. But it is certainly worth every second… It is just awesome. I’ve tried kee kee bentong chicken rice and found it quite nice… looks like I have another new place to explore.. woot! 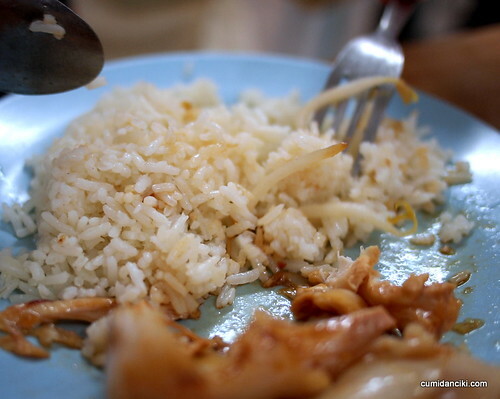 If you are ever in Ipoh – CHICKEN RICE CAPITAL – TASTY! TASTY! TASTY! WOw looks good! You are right. “chicken rice” sounds so simple. So many people could find the best of their own. Same as Korean food. Just so diverse. just like PureGlutton, my fave is my mom’s 😀 both rice and chicken! It might as well be Tasty Monkey’s Chicken Rice! LOL. Thanks my roasted sista. Recently while roaming to London i have headed towards the Gilgamesh restaurant in the main market and where i have orders a white chicken rice and i really enjoyed the meal the taste that i will never forget and i have not get the best taste of chicken rice ever,bebo kobo who owns this restaurant has really maintained a great variety of food. Bak Kut Teh is one of the MUST-EATS in Kuala Lumpur and even better if you have the time to venture down to Klang….